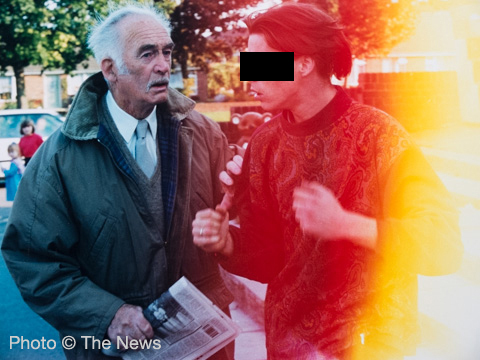 With their history of breaking everything they touch, it was only a matter of time before Johnston Press took their dull-edged, leaden axe to the staff photography jobs at The News in Portsmouth, and so it has come to pass. As a former Portsmouth News photographer (I joined as a trainee in 1992 and left as assistant picture editor in 1998) I’m sorry to see some highly dedicated photographers losing their jobs. I’m sorry to see a daily newspaper , once highly respected by readers and sought-after as an employer by trainee photographers, reduced to running poor quality reporter and reader photos like some small town weekly paper. Not that small town weekly papers should run rubbish photography, but I can’t be Canute to every paper which dumbs down. The internet effect will have been a factor in this, but papers like The News had a chance to invest in their print and online publications and take their cut of internet ad revenues and readership. Instead they wanted unrealistic profit margins and ever-upward share dividends. This was achieved through asset stripping and a lack of investment in talent and inevitably devalued their product. Readers aren’t stupid, but if you treat them as if they are, you’re bound to lose a few. Or a few thousand. I’d risk a bet this latest move will be followed by the paper going weekly. In the longer term it’s hard to see what future there is for a newspaper with no photographers and eventually just a handful of reporters whose sole task will be to copy and paste public relations and reader-submitted copy and insert fuzzy photos into the gaps in between. Advertisers will continue to flee and spend their money elsewhere as the readership continues to leach away. According to its Wikipedia entry, the paper was founded in 1873. Johnston Press took over in 1999, which means it’s taken them a mere 15 years of the paper’s 141-year history to kill it. Nice one. I thought I’d furnish this post with some of the portfolio photos I was allowed to take away with me after my time at The News, some of which hold quite interesting memories and pretty much none of which could ever happen again if it’s left to readers and PR managers to fill the picture boxes between the copy and the adverts. No more big events covered in an interesting way, or un-planned photos which end up being a story in themselves. Just an endless parade of big cheques, big groups and readers’ sunset photos. Which is fitting when you think that the sun might finally have set on creative, engaging and entertaining newspaper photography. 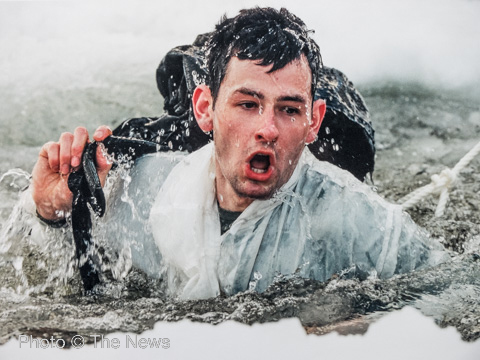 A facility to photograph the Royal Marine Reservists on arctic training in Norway resulted in this shot of one marine learning how to escape a frozen lake. Anthea Turner has her makeup retouched during National Lottery Live. My taking this photo nearly resulted in the show being cancelled until Ms Turner was convinced I’d destroyed the film. The picture ran with the headline “The Photo Anthea Turner Didn’t Want You To See”. I stopped on my way to a job when I spotted this lad kicking another who was lying on the floor. I called the police and took photos. The fogging on the film was where he kicked my camera open. The story grew when it became apparent Police powers were inadequate to dealing with the incident as ABH laws had just changed. We had a lodger when I lived in Portsmouth in the 50s and 60s. He was a typesetter at the news and told us all about the then new IBM optical typesetting that was being introduced.He also lent me his Pentax Spotmatic camera. The paper is here to make a profit for its shareholders so when we publish a picture of say the crowd at the cup final at Wembley we sell extra papers as people want to see if they can spot themselves in the crowd. Hi Michael, I suspect that lodger witnessed the first great modernisation of The News, when web offset was also introduced. When newspapers were first founded, they were set up in order for the super-rich to promote their values and influence government. Making money was secondary, and in fact most were a handy tax break. In the 1960s newspapers flourished and had money to spare to pay for talented photojournalists to travel the world, spending days, weeks or months on assignment. What mattered was hard-hitting content. Then advertisers got twitchy and no longer wanted grim pictures next to their ads for designer furniture and posh consumer goods. Once the publishers became squeezed between the advertisers and the shareholders, I suspect the dynamic changed and the problems may have started there. The fact is, newspapers have almost always existed as a means to make money. The problem is, proper news reporting and the use of quality photography is expensive. Unfortunately for the likes of Johnston Press, they’ve forgotten that without quality content, they have no business. The wembley crowd scenario may have sold more papers in the 1970s, but if someone has translated that into “faces sell papers, so let’s get lots of group photos in,” well they’re sadly mistaken. Endless group photos turn off all the readers who aren’t associated with the articles. The paper looks dull and repetitive, so readers stop buying the paper and advertisers see the sales drop and so they too go elsewhere. A couple of years ago I had a similar conversation with a picture editor who insisted group photos were a good thing and helped sales. I couldn’t convince him otherwise. Earlier this year, he and his last photographer were made redundant. I’m not saying group photos were the only factor, but that policy will have played a part. Anyway, thank you for reading and thank you for your comment.